Emergency services were contacted on Friday after the incident on the 823ft hill in Edinburgh. Air Rescue: Arthur's Seat in Edinburgh. An air rescue was launched to help a man who broke his foot after falling on Arthur's Seat. Emergency services were contacted at around 7.20pm on Friday after the incident on the 823ft hill in Edinburgh. Scottish Fire and Rescue Service appliances were sent to the scene along with a helicopter. A spokesman said: "At the moment we have several appliances there with firefighters in attendance to help rescue a man with a broken foot. "We also have a helicopter assisting the rescue operation." Police Scotland confirmed they were also working to help get the 42-year-old man to safety. 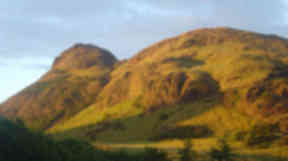 A spokesman said: "At around 7.20pm, police in Edinburgh were alerted that a 42-year-old man had fallen on Arthur's Seat. "We worked with ambulance and fire service to safely get the injured man from the hill." He added the man's injuries were serious but not life-threatening.